For a couple of weeks now we have had thunderstorms on a regular, frequent basis. Early afternoon and evening most days. The storms probably ruin lots of outdoor activity plans. Most of the time it is only about an hour or so of rain, while the rest of the day is hot and sunny. Plants love this type of weather. They grow and grow, flower and produce, the bees have most of the day to get the work of pollination completed, and then a nice drink of water occurs. With this amount of rain weed pulling becomes easy, as even the most pernicious root systems are softened and weakened by the wet conditions. And by mid-day everything is dry. The pigs are panting and looking for a spray down. And every plant is hoping for a big drink too. Typically the end of July/beginning of August is awful hot, with day and night temperatures above 90, little to no rain. It is usually impossible to cool off and watering must be done constantly. With the weather we have now, we can save our pump and our well water and let nature take care. 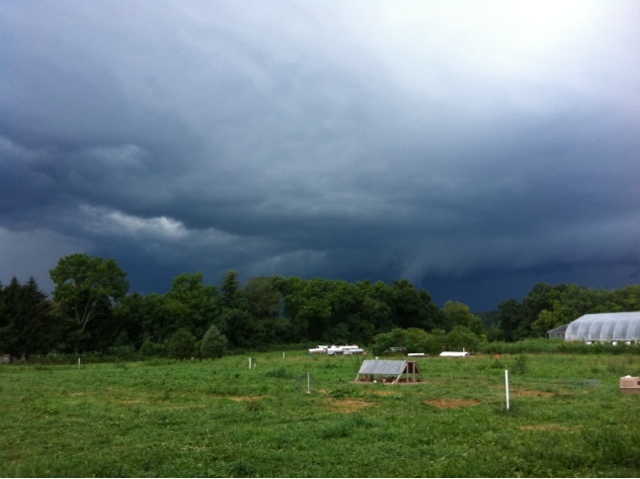 Forecasts continue to include late afternoon thunder showers and the farmers are happy to see them arrive!